I wish I could say that I hate the video games for all the right reasons. As an educator, I want my kids to be inquisitive. They need the intellectual stimulation of books and nature. They need to be finding out the “why” questions in their lives. As a mom who wants her kids to be healthy, I want my kids to make healthy choices. I want them to choose healthy, active options instead of watching tv, or playing wii games (my kids have figured out that you really don’t have to stand up and move a whole lot to bat or bowl). Ironically, these are not the main reasons that I have issues with the video games. Actually, most of my kids are not concerned about the “no TV, no video games” rule for the school week. It is the dear seven-year-old that is the one who has the concern. I started paying attention to his fits of rage in our house. His punching, knocking things over, his refusal to obey, and his lack of submission went hand in hand with the following: television, computer games, Nintendo DS, games on the phone, and the Wii. He is a different child when these things are not within his grasp. He is helpful, (mostly) obedient, a sweet brother, and happy; however, if you add a screen in front of his face, it could turn ugly. I am really thankful that I started paying attention to his angry disposition and figuring out the triggers which caused him to be like this. Really, I hate this for him, because I know how much he loves to play these games. Several years back, I was trying to lose weight (who isn’t, right?) and I had to figure out what was triggering me to overeat. I discovered that when I was angry (or felt anxious, or things seemed out of control) I would eat, preferably the sweeter and saltier the better. About that same time, I listened to an Ozark Christian College professor, Kenny Boles’s sermon called “Anger Management”. (I tried to find a link to it, but was unsuccessful. OCC is in the process of archiving the past chapel sermons.) Because of this sermon, I was reminded that Paul says in Ephesians 4:31 to “Get rid of all bitterness, rage and anger, brawling and slander, along with every kind of malice.” Suddenly, I was made aware of a great sin in my life that God started burning from my heart. I started to understand that God wants me to get rid of my anger, not manage it. I am still in process, and have a long way to go. When we moved to Haiti in 2008, I began home schooling my kids, just my two oldest girls at the time. The class has now grown to the four oldest. I was really shocked (not in a good way) how trying to teach my kids brought such ugly overflow from my heart. I was not the mom I wanted to be for my kids and really dreaded each day of school (just think how the girls felt!). God has continued to work through this mess in my heart and I continue to struggle through it with prayer and petition. I know that God is working out His sanctification in my life. For that I am so very thankful! I realize that when my children don’t obey me, when they are being wise in their own eyes, when they follow their own desires instead of listening to their mom, these are the things that raise my blood pressure, make my heart beat faster, and make me clench my jaws. I recently read some of the works of Charlotte Mason, a great philosopher of education, which God used to strike my heart. She says that we need to see our children as “humans”. You can read more of her philosophy here. Yes, I am guilty of plowing over my kids with little thought to their feelings, their emotions, and their needs. Guess what this makes them…oh, angry? Yes, as a Christian mom, I should not ever act this way with my kids! I think I am finally getting it. Thank God, that His mercies are new every morning! So instead of hating the video games and how they make my son behave poorly, I should be thankful for them. They have revealed an area of sin that my little guy can start working on early in his life instead of waiting until he is almost 30. What a privilege it is to get to help him on that journey! What a privilege to pray with him and for him to the One who wants us all to be transformed into the image of His Son. Sweet Jett’s birthday was way back in February. Tomorrow, he will finally get to play with his birthday present! 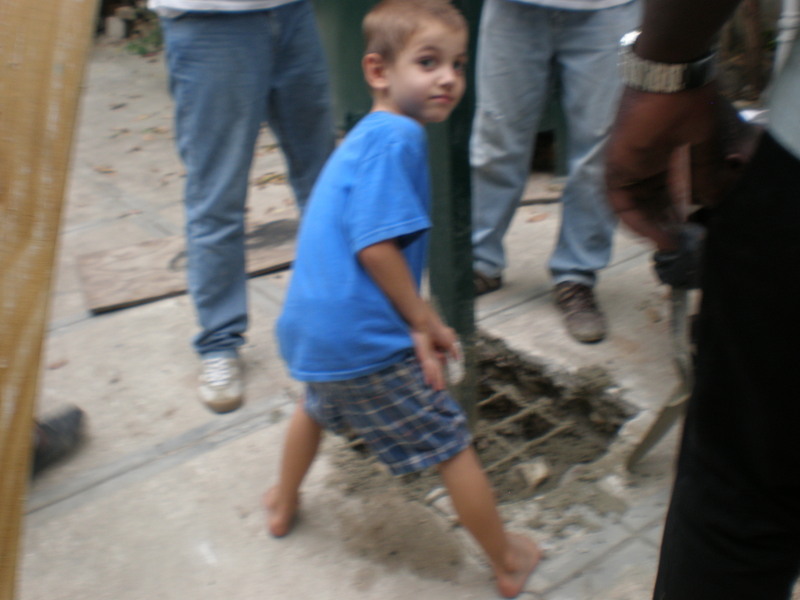 A group of Operation Blessing guys came over this afternoon to help Eric to put the post in the ground. They worked really hard; I made them pizza. Another successful day around here! I am looking forward to another activity for the kids to have to do around here that has nothing to do with video games or talking dog movies (have I mentioned that I am really, really tired of talking dog movies?). I am so thankful for the trampoline that Jim and Debbie Hamilton bought for the kiddos and put into our container before we moved to Haiti. Between the trampoline and the basketball goal, the kids should go to bed really tired every night! Mixing concrete the old-fashioned way. Jetty getting in on the action. Just one year ago, we paid our rent and started moving into our house. I know it was exactly one year ago today, because our rent was due today. 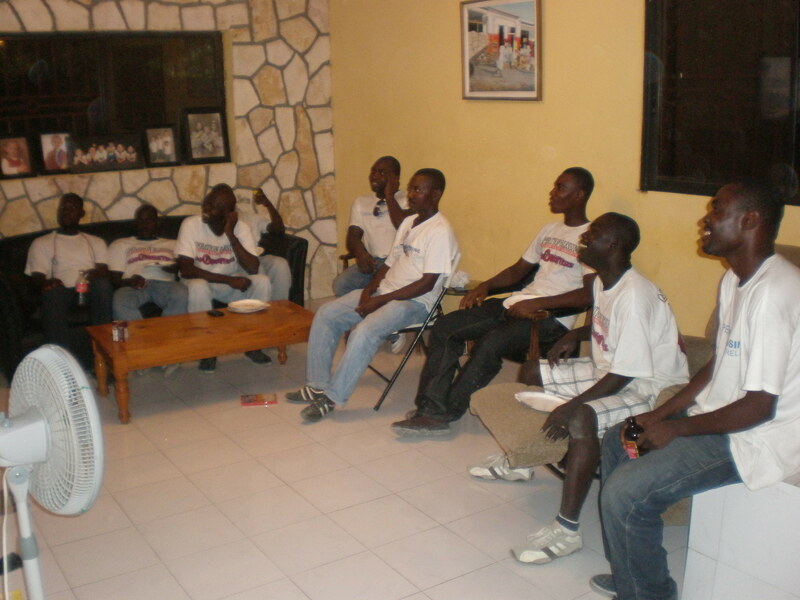 In Haiti you pay rent by the year, up front, no refunds. Just after we moved in last year, a strong storm blew into Port-au-Prince and the whole area was within moments pounded by heavy rain and extremely strong winds. We remember this day so well and the kids still refer to it as the Friday storm because a window blew into the house from a three story tower/stairwell. Glass shattered everywhere and water rained through the gaping hole in the wall. The event shook everyone up and caused a lot of anxiety from the earthquake to resurface. Our landlord never sent anyone to fix the window until today (because the rent was due and Eric said he wasn’t paying until the window was fixed!). These guys show up today to fix the window. They didn’t have their own ladder and had to use Eric’s, which was a little short to complete the job. 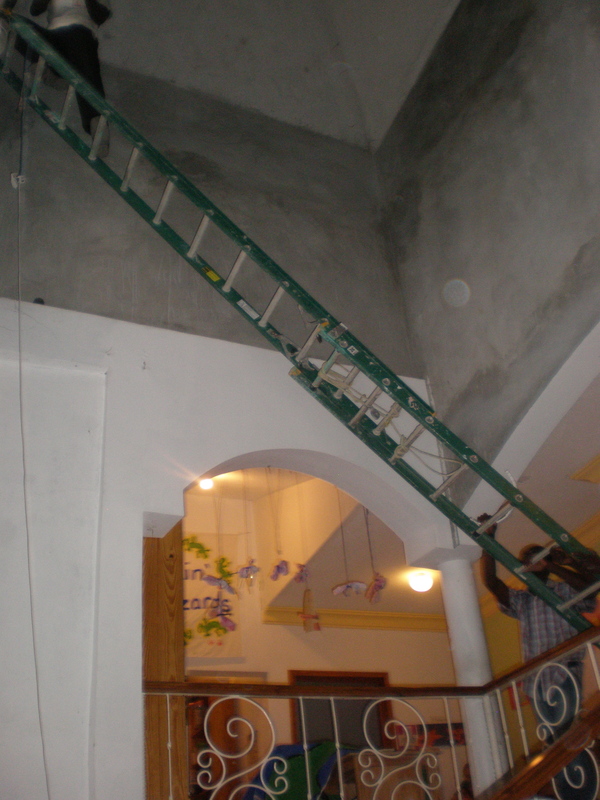 Eric suggested they bring the ladder upstairs to our hall which is open to the stairwell and put the ladder from the hallway up to the third story window that the men were changing. Eric was not yet here while they were doing this and I was somewhat freaking out because of the danger involved in the prospect of doing this. I very politely asked them not to climb up there until Eric was here. Sweet baby Aimee distracted me for just a few minutes and the next thing I know, the guy is all the way up to the top. Wow, talk about a knotted stomach…And such is life in Haiti. The ladder stretched across the foyer down below. Craziness. It wasn't so scary after he got up there, and I was glad when Eric finally showed up! As it turns out, they fixed the window and no one fell. 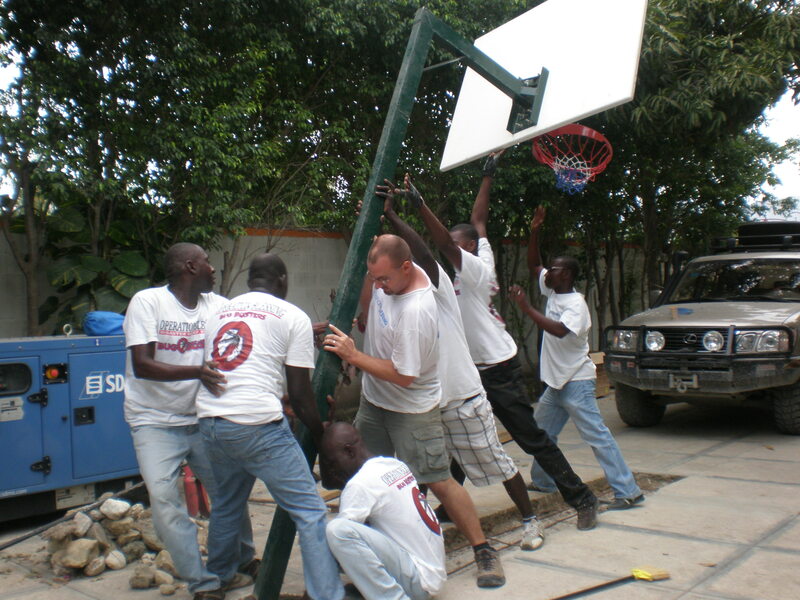 Up tomorrow…a basketball goal in the driveway. We will see how that goes down. Well, the whole blogging thing came and went for Eric and me…seems like it is time to bring it back around again. We will see how it goes. 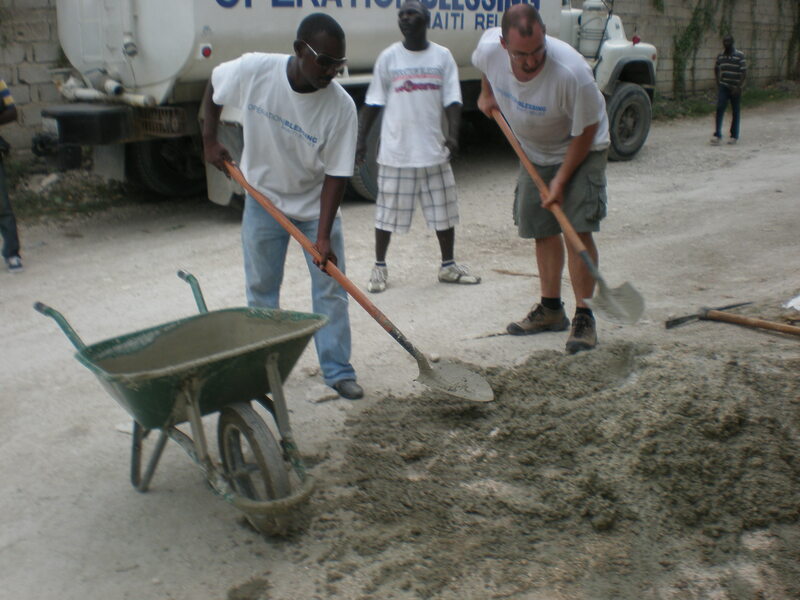 I would love to share about life in Haiti, the work that Eric is privileged to participate in through Operation Blessing, and our Lotz home school. I am anxious to get started in order to keep up with old friends and hopefully, meet a few new ones along the way. Mostly, I think the Grandmas will be happier than anyone!